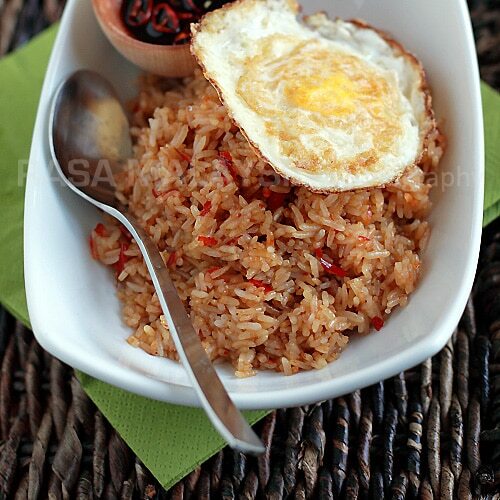 Nasi goreng or Indonesian fried rice is one of the most requested recipes on Rasa Malaysia. I have received many emails from readers requesting for a nasi goreng recipe. For those who are anxiously awaiting a nasi goreng post, wait no more as I have gotten just the perfect nasi goreng recipe for you. Adapted from James Oseland’s Cradle of Flavor coobook—a bible for authentic Indonesian and Malaysian/Singapore cuisines—this nasi goreng is the Javanese version of fried rice. As Jim indicated in his cookbook, a truly authentic nasi goreng Indonesia is plain and simple, consisting of leftover rice stir-fried with a flavoring paste. Ingredients such as shrimp, meat, and vegetables are rarely, if ever, added to it. While nasi goreng is available in Indonesia, Malaysia and Singapore, the Indonesian version is my favorite. Topped with a fried egg (a distinctive note of Indonesian’s version), nasi goreng is a meal that is both hearty and gratifying. Making nasi goreng also reminded me of my fond memories while traveling in Indonesia—a country with vibrant and colorful culinary traditions which I intend to explore more in the near future. Nasi goreng/fried rice is a popular dish in Southeast Asia. This recipe is an Indonesian version of fried rice served with fried egg. Break the overnight/leftover rice using the back of a spoon so they don't clump together. In a wok, toast the belacan on low heat until it becomes dry and aromatic. Toasted belacan should be somewhat powdery and appear like tiny granules. Fry an egg (well-done) and set aside. Using a mortar and pestle or a mini food processor, blend the shallot, garlic, red chili, and toasted belacan. Transfer the blended flavoring paste into a small saucer. Heat up a wok and add oil. Add the flavoring paste and stir-fry until aromatic or when the oil separates. Add the rice into the wok and stir well with the flavoring paste. Add kecap manis and palm sugar into the rice and continue to stir-fry and make sure that they are well blended with the rice. Dish out, top the nasi goreng with the fried egg and serve immediately. In Indonesia, nasi goreng is often served with various sides such fried prawn crackers, fresh vegetables such as lettuce, sliced cucumber, and sliced tomatoes. However, you can just make it plain like what I did. I also love sliced red chili dipped in kecap manis as a condiment. It's great with the fried egg! thank you for yours… I’ll try with a fried egg. Dominique – yes, this nasi goreng reminds me of Bali, too. I want to move there and eat nasi goreng every morning!!! Have nominated you for the kreativ blogger award…. I love fried rice and your version in this post looks wonderful. I love the addition of the fried egg on top- that makes everything better :) Beautiful photos as well! Yes, fried egg on top on nasi goreng is the best. Don’t really like the mixed eggs version. I love nasi goreng, and this version is very different than the one I make, so I’m looking forward to trying it. Love the fried egg on top! I like acar (achar) on the side and in South Sulawesi it always comes with a slice of lime! A slice of lime, that’s interesting. I have to travel to Indonesia again and explore all the spice islands like James Oseland did. I’m an Indo who hasn’t been back home for a long time… This sure makes me miss home. Good stuff! Yes, this is a very homey fried rice. I used to have this for breakfast. Sometimes we scrambled the eggs. However, fried egg is my preferred topping. Thank you for your kind words for the victims of earthquake in Indonesia as well as the typhoon in the Philippines, Vietnam, and Cambodia. Tuty – yes, fried eggs on nasi goreng totally rocks. Love it with kecap manis. Kecap Manis is Indonesian sweet soy sauce. Belacan is shrimp paste. You can get them in Asian stores or Southeast Asian stores. Your rice looks fantastic! I just added Cradle of Flavor to my wish list the other day. Can’t wait to get it some day soon. Lisa – Cradle of Flavor is a great cookbook and it’s fun to read. James writes so well and the knowledge he has about the regional cuisines are simply amazing. He knows everything in every single details, things that I take for granted because I was born there but he knows the history, the ingredients, the authentic cooking methods and recipes. He is brilliant. Fried rice with egg–a simple pleasure! Can’t wait to try this recipe with an over-easy egg. I’m so happy I found rasamalaysia.com!!! I LOVE your recipes. Do you know how to make salted (duck) eggs? Can you use chicken eggs? I would prefer a salted egg (duck or chicken) with my Nasi Lemak. This looks so good and simple!! I only have one very poorly stocked asian market where I live. Can I substitute Fish Sauce for the belacan?? Yeah you can use the fish sauce but go easy with it but this makes it more of a thai dish. to replace the belecan you can use any dried fish or shrimp paste or some times if i have run out i will use crushed or blended dried anchovies( ikan bilis ) far an authentic Kampong (village ) nasi goreng. Fried rice and egg is a favorite in my house. When I lived in Asia, I ate nasi goreng at least once a week. I love it but haven’t been able to find a place that makes it well where we live now. I’m so happy that you shared the recipe, now I’ll just make it at home! I’m from Holland and we looove Indonesian food, on top of that my moms adoptive parents were indonesian so I basically grew up with it. In Holland they put a lot of things in their fried rice and call it nasi goreng, but without all the add ins it makes for a better side dish, I think. Definitely trying this version soon. Sam – thanks for your sweet note. Nasi goreng is simply awesome! I love nasi goreng. I love it with the shrimp chip and a side of satay. Yum! Shrimp chips and satay sounds great with nasi goreng. yum yum..this reminds me of Bali too! Simple and tasty! Can any one help me please. I used to eat a malay halal version of nasi goreng. It was red in colour and with more chilli. is the redness just tomato paste or a colouring or spice. cant seem to find a recipe so if any nice malay people would help me i would be grateful. oh and im also looking for a sarawak style assam laksa recipe. tarima kasi. Kecap manis – sweet and dark soy sauce. Belacan – Malaysian shrimp paste. Can substitute with fish sauce. i want to eat nasi goreng, but i dont want nasi goreng kampung, i want nasi goreng payau..that’s right i go eat it now! Just one question: what do you mean by toasting the belacan? Isn’t belacan already dry when you buy it from the shops? And when you break it off, it is already granulated. Or does it still require extra toasting? Thanks lots! This recipe was good =) The one i did today was a little bit bland though coz I was cooking for A LOT of people and I misjudged the amount required for the flavouring paste. Siti – you have to toast in a wok to release its full aroma. I can purchase terasi from 99 Ranch Market here in So Cal, but question is, how to contain the smell when you toast it inside the house? I’m an Indonesian, but my husband is a haole and I don’t think he appreciates the smell. I love terasi, though. Help!! I am so glad I found this recipe. I used to live in Indonesia and haven’t had Nasi Goreng in about 10 years. I will definitely be making this recipe. I am so glad you put the egg on top and used traditional ingredients. Can’t wait to eat it!! Hi. This looks like a great recipe. The only thing is that I’m vegetarian (and I don’t eat seafood). What can I use instead of shrimp paste? Or can I just leave it out? Yes, you can but it will not be as tasty. thank you for the recipe! my husband and i just came back from our honeymoon in bali, and we fell in love with indonesian food. i can’t wait to make this! Many of your recipes call for red chili’s. What kind of chili are you referring to? The Asian market near me only carries Thai, serrano, and jalapeno chilis. None of them are red, but I’ve been using either Thai or serrano chilis as substitutes. Thanks! Red chilies. They are red in color. Wahhh,, nyummy banget dahhh.. huhuy..
Could you please tell me how to make pie tees? Thank you for recipe. My hubby & children have Javanese heritage so always trying to find delicious Indo food in Australia & perfect if we can make ourselves. Can you substitute Thai shrimp paste for the belacan? I used your recipe complete with the fried egg but also added a fried banana, absolutely delicious, reminded me of my time in Indonesia and Bali. Thanks for trying the nasi goreng recipe! I have a shrimp allergy.. trying to figure out what could sub for the belcan? or will it not matter that much? Hi Selamat, I folllowed a recipe in a cookbook so I am not too sure! Thanks for letting me know.